I watched a swan land on the water tonight. It was beautiful, so graceful; her wings outstretched feeling the wind beneath them, letting the air guide the way to her destination with ease, precision and power. She knew just how much force was needed to land so she could stay above water; gracefully going from flying to swimming. The transition was remarkable… it was perfect. 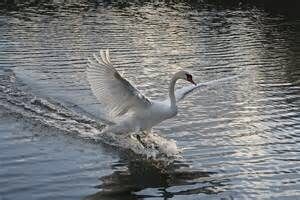 Unlike the swan, my landing into this new phase of my life hasn’t been so graceful. My wings have flapped around wildly, I hovered above the water before my final descent and when I landed I skipped like a rock off choppy waters. Now, I’m swimming forward but there’s a tough undertow that I can feel pulling beneath me. Sometimes during my journey I don’t think I was processing exactly what was happening. I was in flight, sights set on my destination and nothing else. Now that I’ve landed, I’m recounting the journey and it makes me realize just how hard I hit the bumps. It was like flying through a lightening storm. When I was able, I avoided the strikes but I couldn’t avoid them all…there was too much wind and noise and chaos going on around me to dodge everything that came my way. The bolts hurt both physically and emotionally but in their own way, they were beautiful and brought light to my life. Finally, it’s time to slow down and tread water for a little bit. Time to just be a 27 year old. Time to let the current peacefully pull me along. Time to be one with my surroundings and the blessings that I have experienced in this life. I’ll never be as graceful as the swan but I can try to emulate her and some of her beautiful qualities: like stretching her wings to show her power, like her ability to swim forward gently, like how she seems to be satisfied staying in one place, like how she lets her presence been seen and felt and like her ability to be bring others joy just by doing what she was meant to do. Reading tonight’s Inspiration made me, selfishly, think of what I went through and now, how I am dealing with my feelings. I also, am trying to just live and appreciate life as your 83 year old Grandmother. A real plus, I have an appointment with my friend and hairdresser, Donna, to deal with my President Obama hairdo, Love you! It’s not selfish to think about what you went through Gram!!! Enjoy your hairdressing appointment. Love you so much!